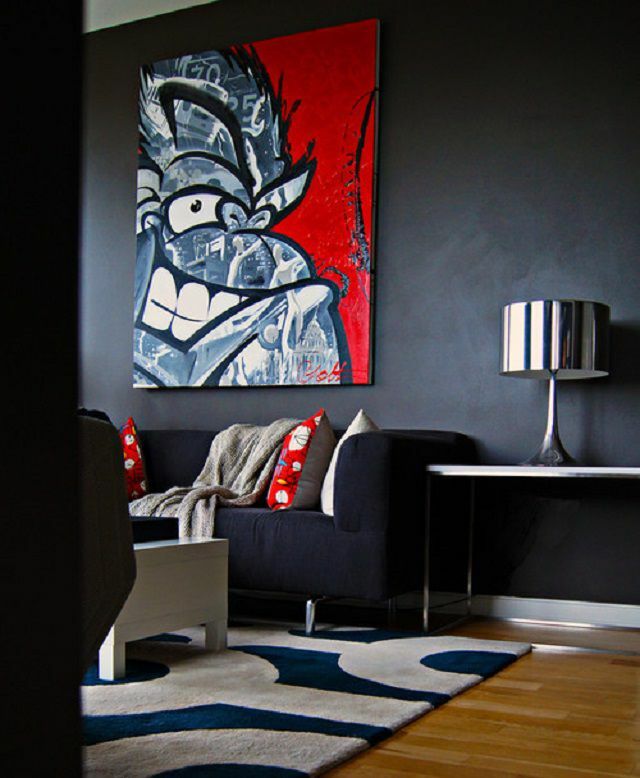 There's something unexpected, something almost aggressively cool that street art brings to a home's interior. Whether it's painted directly onto a wall or it's a piece properly hung as traditional art, street art is moving indoors. And this trend isn’t just for lofts and modern homes — even more traditional homes can benefit from this playful, edgy style.This large, bold piece perfectly ties the room together and plays nicely with the rug and pillows while brightening up the dark walls and sofa. No windows and a long, narrow shape made this powder room the perfect spot for something seriously bold. We love the trend of dark colors and intense patterns in powder rooms, and this graffiti mural takes that trend to a whole new level. Punch up your back patio with a mural on corrugated metal, or even directly on a fence. It’ll add color to the space and secure your reputation in the neighborhood as the “cool, edgy neighbor.” This outdoor wonder was created by the artist Bware of Sparks in Dallas, Texas. Your little girl doesn't need another Elsa doll or a Rainbow Loom — what she needs is street cred. The hot pink elements in this tagged wall art are perfect for the room's other pink moments, creating a color story that energizes the otherwise deceptively neutral space. The strong outlines in black add an edgy, moody spark and on a clear day, the blue even picks up the color of a sunny sky. So you like how it looks, but you’re not quite sure you want to dedicate a whole wall to it? No sweat. Try including a graffiti-adorned side table or stool in your room for just the right amount of rebellious style. This works particularly well in more traditional spaces where it can contrast with other pieces. What’s fun about having street art in your home is that it’s always unexpected and can serve as a fantastic conversation starter when you have people over. Here, you can’t help but smile back when you round the corner and come face to face with a skull with a gold tooth. This piece was done by Austin artist ER. If you’re interested in incorporating street art in your home, keep an eye out for work around your city, and if something strikes you as particularly awesome, look for the artist’s signature and Google them. They’ll more than likely be flattered to hear you want to commission a piece from them. Your city might even have a collective that makes it easy to connect with an artist. In Austin, Texas, there’s sprATX, a community of local artists who’ve banded together to have their own storefront and teach classes on everything from wheatpasting to can control.